A businessman, an educator and a politician walk into a room. There’s no punchline here. In many other regions – that don’t count collaboration as a strength – this may be the beginning of a counterproductive encounter. In San Diego, this is how we find solutions. 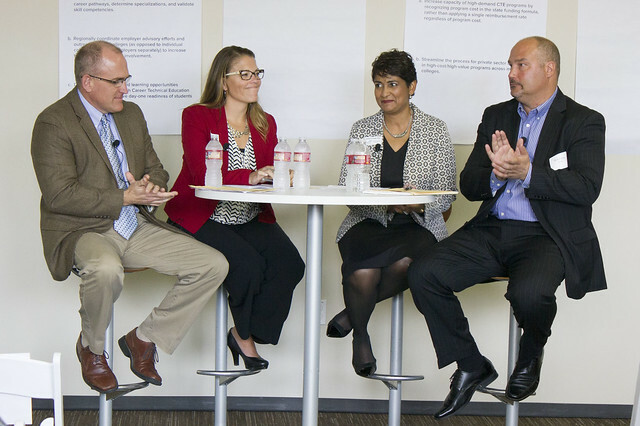 At the Strong Workforce Town Hall held at Illumina on Wednesday, business people, educators, economic and workforce development professionals, and politicians gathered to address how the region will close the impending skills gap. 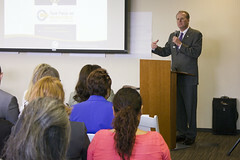 California Community Colleges play a vital role in preparing workers for jobs and strengthening the economy. Wednesday’s conversation was part of a series of ‘town hall’ style meetings held throughout the state to help California’s dynamic community college system close the skills gap. The facts are alarming: by 2020, there will be 6.3 million job openings in the state of California. If we want to remain a center for innovation, we must have the workforce to get us there. So how do you prepare the 2.1 million students in California for tomorrow’s workforce? Relationships: Perhaps the most crucial component, the community colleges must develop stronger relationships with employers. Rick Urban, COO at Quality Control Manufacturing in Santee, said that his business depends on having, strong, skilled workers. With the help of East County EDC and coordination with community colleges, he was able to develop a pipeline to recruit and train technical talent. Up in Oceanside, Genentech seeks to work with the community colleges to find the medical device manufacturing and R&D talent it needs to succeed. "We need an agile and flexible workforce,” said Adria Harris, an HR representative at the company. The good news is lawmakers are already beginning to adapt. A pilot program will give community colleges throughout the state the opportunity to begin offering bachelor’s degrees in select programs next year. Based on workforce needs, Mira Costa College was recently approved to begin offering bachelor’s degrees in bio-manufacturing. Resources: Financial resources are always going to be an issue. As a state (and region), we must get creative with how we fund these crucial job training programs. It’s not only about identifying new resources, but also figuring out how to redirect resources that make sense for industries – such as maritime and biotech – that have a strong presence in the region. Re-thinking the Rules: As a state-run agency, bureaucracy will always be a part of the community college system. However, Cooke encouraged administrators and policy makers to think creatively about these regulations.